A bold experiment attempted by one ambitious Digby scientist. There was a theory about the ability to create a powerful version of the RhinoBot without the anger and frustration modules, allowing a safer manufacturing process for the scientists and engineers alike. Told they were mad, told they were messing with powers beyond their control, almost laughed out of every respectable laboratory citing that any attempts to change this process would caused massive power loss... until the festive formula was found! Now, the Enraged RhinoBot has been successfully Un-Raged! Ready to embrace the season bringing happiness and warmth with milk and cookies, but at an equally destructive rate! The Festive Un-Raged RhinoBot Skin can be used on Enraged RhinoBot. The trap's stats (power, power bonus, attraction bonus, etc.) are not changed. The Festive Un-Raged RhinoBot Skin may be made available during the annual Great Winter Hunt event and can be traded on the Marketplace or through Give To Friends. 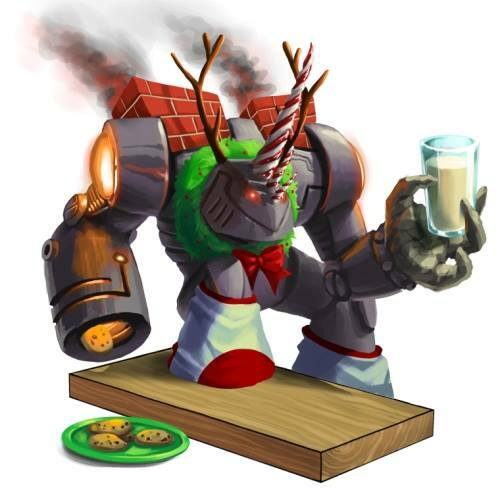 10 December 2013: The Festive Un-Raged RhinoBot Skin was released at the start of the Great Winter Snowball Fight event. It could also be obtained from the Festive Skin Pack (either by direct Donation or from the Marketplace). This page was last edited on 9 December 2017, at 11:54.